Thieves used a forklift truck to tear down the wall of a supermarket and rip out a cash machine. 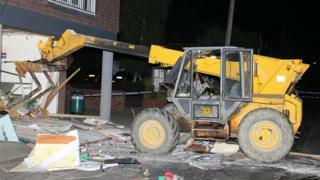 The front spokes of the JCB vehicle were used to break down the external wall of the Co-op store in Rudgwick, West Sussex. The raiders wrenched out the cash machine and made off with it before police arrived at about 02:45 BST. The area was cordoned off, and a spokeswoman for Sussex Police said inquires were "ongoing". It is not yet known how much money was in the machine. The shop was due to re-open later.